Almost every HVAC company out there is a professional at residential heating and air conditioning installations and maintenance. But you should never assume that they have the same experience and knowledge required to perform commercial HVAC services in Brandon, MS. In this post, we’ll go over a couple big reasons why you should never settle on residential service for commercial HVAC needs. As the owner of a commercial space, you have a responsibility of keeping the inhabitants of the building safe and healthy. Not only is it required by the Occupational Safety and Health Administration (OSHA), but anything less than comfortable is going to undermine your success. Employees who are forced to work for long hours in an uncomfortable building won’t be nearly as productive, and if the air quality is low enough, it could put them at risk for sickness. If your building is the type that welcomes customers, something as simple as a humid and hot building might drive them away. In a residential space, this responsibility doesn’t exist, and you aren’t obligated to maintaining comfort and indoor air quality levels. Although we highly recommend you do treat your home in the same way, it’s simply not a requirement in residential settings. Plus, depending on the type of business you’re running, the tools and chemicals you use may contribute to lowered indoor air quality. Without proper ventilation or air purification, these contaminants will only increase as they circulate through your air flow. In the home, ductless split systems and central air conditioners are the ideal choices. They are both cost-effective solutions for your home that will last for years to come. In a commercial setting, however, you can’t expect satisfaction from these types of AC. Instead, the most effective type is the packaged air conditioning unit. For one, these units are heat pumps. That means the same device can generate both warm and cool air, allowing you to use the same system for both summer and winter seasons. Second, the design of these units is extremely useful for businesses. Other air conditioners are “split” systems, meaning that there are two units in the system—one for the indoors and one for the outdoors. As the name “packaged” would indicate, a packaged AC includes both units in the same cabinet. Having both units on the rooftop will use your commercial real estate more efficiently, as well as making repairs and maintenance calls easier. If you’ve ever been on the rooftop of a building or have seen them from Google Maps, you may have seen several of these units shoved together. That’s because packaged AC units are modular. 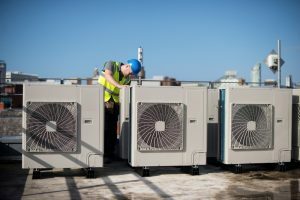 For our purposes, that simply means that you can connect more packaged units to generate more heating and cooling power. In a residential setting, the only way you’d be able to upgrade is by replacing the entire system, which is not feasible for expanding businesses. Don’t put your employees and customers at risk! Get your commercial HVAC needs done by the professionals. Contact AirSouth Cooling and Heating today.